A North Carolina man has been arrested after he failed to return a movie he rented 14 years ago. James Meyers said he was pulled over for driving his car with a defective taillight on Tuesday when the police officer told him there was a warrant out for his arrest. In 2002, Mr Meyers rented the comedy Freddie Got Fingered from J&J's Video, which has since closed. He had been charged with failure to return rental property, a misdemeanour. "The officer said, 'I don't know how to tell you this but there's a warrant out for your arrest from 2002. ... I thought he was joking," Mr Meyers told WSOC, a local TV station. "For the first time I got put in handcuffs." He was booked at the police station and was given a court date, but the charge was later dismissed. He faced a fine of $200 (£140). Freddie Got Fingered, about an out-of-work cartoonist who moves in with his parents, was criticised by critics and was considered a disappointment at the box office when it was released in 2001. 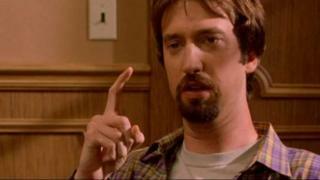 The story even caught the attention of the movie's star comedian Tom Green. Green told the Australian TV show The Project that he would have gladly paid the fine for Mr Meyer. "I think it's sort of an example of how bureaucracy can get out of control," Mr Green said.